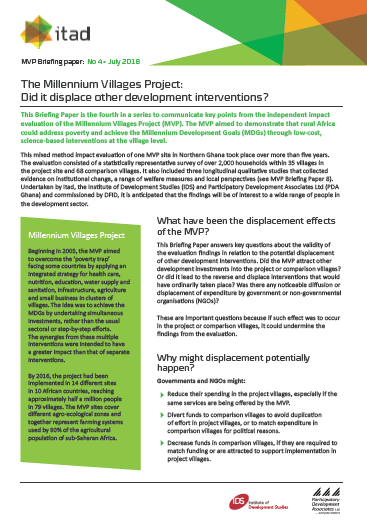 This Briefing Paper is the fourth in a series to communicate key points from the independent impact evaluation of the Millennium Villages Project (MVP). The MVP aimed to demonstrate that rural Africa could address poverty and achieve the Millennium Development Goals (MDGs) through low-cost, science-based interventions at the village level. This Briefing Paper answers key questions about the validity of the evaluation findings in relation to the potential displacement of other development interventions. Did the MVP attract other development investments into the project or comparison villages? Or did it lead to the reverse and displace interventions that would have ordinarily taken place? Was there any noticeable diffusion or displacement of expenditure by government or non-governmental organisations (NGOs)?